This Vegan Spaghetti Sauce is better than any store bought kind we've tried. It only takes a few minutes to prepare but the taste and aroma is worth it. Cut the spaghetti squash in half and clean out the seeds. Place in a large casserole dish face down in about 1 inch of water. Bake for 1 hour or until soft. The spaghetti strands should be al dente when done. Chop the shallots and mince the garlic. Keep separate. On a cutting board, smash the fennel seeds with a hammer or heavy pan. This is also a good use for your old meat clever if you have one. Don't use a grinder. Add the tomato paste and spices to a small bowl and set aside. Heat the vegetable broth in a large saucepan over medium heat. Add the shallots and cook until soft and semi-translucent. About 3 minutes. Add more vegetable broth if needed. Add the garlic to the shallots. Sauté for 1 minute. Add the tomatoes, tomato paste and spices to the pan. Stir well. Add the Beefy Crumble and stir. 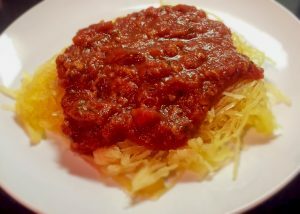 To prepare spaghetti squash, use a fork to scrape out the inside of the squash. It will come out in strands that look like spaghetti. Use about 1/4 of a large squash or 1/2 of a smaller one per serving. 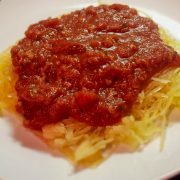 Server the sauce over the spaghetti squash. Garnish with parsley flakes to make it look pretty. Serving size is about a cup of sauce and 1/4 of a large spaghetti squash. When possible, use boxed tomatoes instead of canned. Most canned tomatoes have BPA linings and the acid from the tomatoes can corrode it, which means you'll be eating a toxic chemical. Amelia and I prefer Pomi, which you can get at Whole Foods or buy it in bulk on Amazon. Instead of opening a can of tomato paste for 2 tablespoons, you can buy it in a tube and squeeze out only what you need. 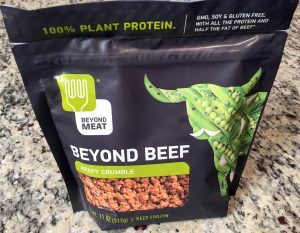 You don't have to use the Beyond Beef Beefy Crumble, but it does add extra protein and a nice texture to the sauce. You can also slice up about 2 cups of mushrooms, sauté them with the shallots and garlic, and use those in place of the meatless meat.